Imagine you’re assessing an athlete, and their squat pattern is absolutely brutal. Usually, the last thing you’re going to do is go right to a squat as part of their training. In other words, simply coaching it differently usually won’t improve the pattern immediately. Rather, you typically need “rebuild” the pattern by working with everything from ankle and hip mobility to core control, ultimately progressing to movements that replicate the squatting pattern. …might be quickly corrected with some of these three cues on a back to wall shoulder flexion pattern. This is also true of push-up assessments and shoulder abduction and external rotation tests we do; funky patterns are usually cleaned up quickly with some subtle cueing. This just isn’t the case as much in the lower body, though. Why the difference? My theory is that because we’re weight-bearing all day, the lower extremity is potentially less responsive to the addition of good stiffness in the right places. Conversely, a little bit of stiffness in serratus anterior, lower trap, or posterior cuff seems to go a long way in quickly improving upper extremity movement. 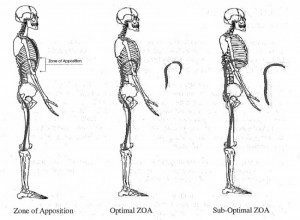 My experience with the Postural Restoration Institute also leads me to believe that creating a good zone of apposition can have lead to a more pronounced transient movement in the upper extremity than it does in the lower extremity. This is likely because the rib cage is directly involved with the shoulder girdle, whereas the relationship with the lower extremity (ribs –> spine –> pelvis) is less direct. These differences also seem to at least partially explain why upper extremity posture is much easier to change than lower extremity positioning. It’s far more common to see a scapular anterior tilt change markedly than it is to see an anterior pelvic tilt substantially reduced. First off, true tendinitis is actually quite rare. In this landmark paper, Maffulli et al. went to great lengths to demonstrate that the overwhelming majority of the overuse tendon conditions we see are actually tendinOSIS (degenerative) and not tendinITIS (inflammatory). It may seem like wordplay, but it’s actually a very important differentiation to make: if you’re dealing with a biceps issue, it’s probably tendinosis. Second, if you speak with any forward thinking orthopedic shoulder specialist or rehabilitation expert, they’ll tell you that there are a lot of differential diagnoses for anterior (front) shoulder pain. It could be referred pain from further up (cervical disc issues, tissue density at scalenes/sternocleidomastoid/subclavius/pec minor, or thoracic outlet syndome), rotator cuff injury or tendinopathy, anterior capsule injury, a lat strain or tendinopathy, labral pathology, nerve irritation at the shoulder itself, arthritis, a Bankart lesion, osteolysis of the distal clavicle, AC joint injury, and a host of other factors. 3. Thoracic outlet surgery really isn’t a shoulder surgery. With this intervention, the surgeon is removing the first (top) rib to provide “clearance” for the nerves and vascular structures to pass underneath the clavicle. Additionally, surgeons may opt to perform a scalenectomy, where they surgically remove a portion of the anterior scalenes, which may have hypertrophied (grown) due to chronic overuse. Again, this is not a “shoulder” procedure. This, for me, is the only time this becomes somewhat of a “shoulder” surgery – and it’s an indirect relationship that doesn’t truly involve the joint. We’re still nowhere near the glenohumeral (ball-and-socket) joint that most people consider the true shoulder. All that said, many people consider the “shoulder girdle” a collection of joints that includes the sternoclavicular, acromioclavicular, glenohumeral, and scapulothoracic articulations. In this case, though, the media just doesn’t have a clue what they’re trying to describe. With that in mind, hopefully this turned into somewhat of an educational rant. …you can see that the scoop toss requires far less shoulder internal rotation and horizontal adduction, and distraction forces on the joint are far lower at ball release. The shotput is much more stressful to the joint, so it’s better saved for much later on in the rehab process. 5. Adequate rotator cuff control is about sufficient strength and proper timing – in the right positions. To have a healthy shoulder, your cuff needs to be strong and “aware” enough to do its job in the position that matters. If you think about the most shoulder problem, there is pain at some extreme: the overhead position of a press, the lay-back phase of throwing, or the bar-on-your back position in squatting. For some reason, though, the overwhelming majority of cuff strength tests take place with the arms at the sides or right at 90 degrees of elevation. Sure, these positions might give us a glimpse at strength without provoking symptoms, but they really don’t speak much to functional capacity in the positions that matter. Obviously, you can make it even more functional by going into a half-kneeling, split-stance, or standing position. The point is that there are a lot of athletes who can test pretty well in positions that don’t matter, but horribly in the postures that do. It’s not uncommon to hear about someone with an ACL tear going through a month or so of physical therapy before the surgery actually takes place. Basically, they get a head start on range-of-motion and motor control work while swelling goes down (and, in some cases, some healing of an associated MCL injury may need to occur). I’m surprised this approach isn’t utilized as much with shoulder surgeries. It wouldn’t be applicable to every situation, of course, but I think that in some cases, it can be useful to have a pre-operative baseline of range-of-motion. This is particularly true in cases of chronic throwing shoulder injuries where regaining the right amount of external rotation is crucial for return to high level function. Adding in some work on cuff strength/timing, scapular control, and thoracic mobility before hopping in a sling for 4-6 weeks probably wouldn’t hurt the case, either. And, as an added bonus, if this was more common, I think we’d find quite a few people who just so happen to become asymptomatic, allowing them to cancel their surgeries. It’s probably wishful thinking on my part, but that’s what these random thoughts articles are all about.